Well hello again friends! I’m Allie with Miss Allie’s Kitchen, and I’m so glad to be sharing on The Melrose Family for the second time this year! 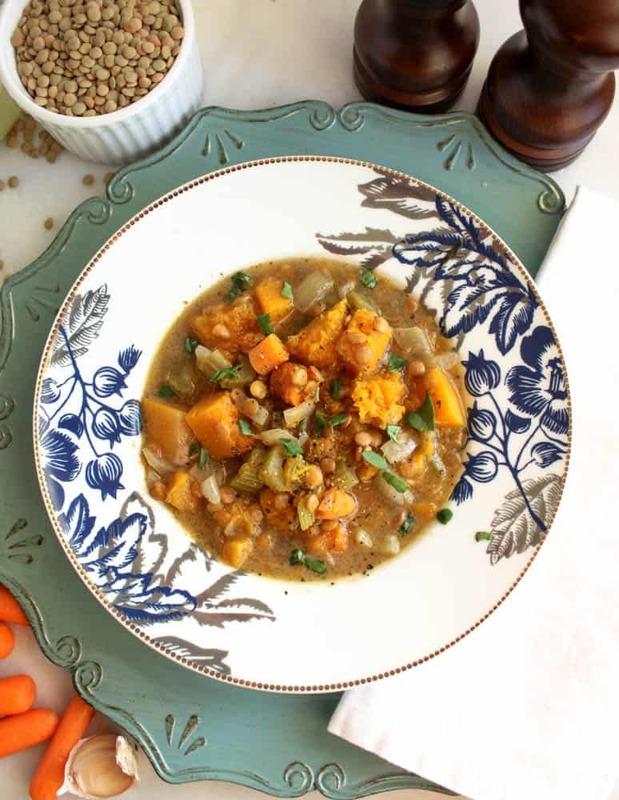 Today we’ll be making my recipe for creamy Lentil & Butternut Squash Slow Cooker Soup. It’s dairy free, gluten free, and oh so comforting and filling. Since we’re getting to know each other now, I’ll be straight with you – lentils have always made me nervous. I have never known how to prepare them and I don’t eat them very frequently. So, what’s a girl to do? Figure it out, that’s what! “Why not just throw them in the slow cooker and see how they turn out”, I thought, “They seem so nutritious. Everything else I put in there, like this Spicy Chorizo & Collard Green Soup, comes out spectacular”. So, to the drawing board I went. Bingo, bango, boomo we hit the jackpot. This soup, which I created for all of you, turned out to be a real winner, kind of like these Pumpkin Pie Power Balls I made the other week. Anyway, back to the lentils. Which are crazy easy to work with. Like, easier than rice. Yep. 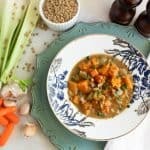 I found that in the slow cooker, the lentils took on an immensely tender texture, and were able to absorb the flavor of the ingredients around them. We’ll use coconut milk here to make the soup velvety smooth, without the dairy, and the sage not only flavors the dish wonderfully but lights your kitchen up with rich, earthy aromas. Did you know that lentils are high in fiber and protein and provide sources of nutrients like iron, zinc and B6? * Pretty neat, huh? I’m a meat eater, but with a nutrient powerhouse like lentils in the mix, I decided to leave meat out, making it perfect for a Meatless Monday Meal. For more weeknight meal solutions make sure to check out my recipes for this Sweet Potato Pasta Bake and this Chicken Corn Quinoa Casserole. I’ve been working to create my recipes with 10 ingredients or less and with no more prep time than 30 minutes. This soup certainly fits that bill. With exactly 10 ingredients and about 10 minutes of prep time, this baby is sure to rescue weeknight meal burnout everywhere! Begin by measuring your lentils into a fine mesh strainer and rinsing under cool water. Set them aside. Next, peel, de-seed, and chop your butternut squash into about 1 inch, bite-sized pieces. Add them to the bottom of the crockpot. Chop up your onion, carrot, and celery, and dice your garlic. Add this with the butternut squash. Lastly, top the mixture with the lentils and spices. I like to make this the night before I’m going to serve and place it in the fridge overnight. In the morning, I take out the crop pot, add the chicken stock and coconut milk, set it to low and let the soup simmer all day long or for at least 8 hours. When you come home, this will be creamy and combined for consuming. This soup can easily be made into a vegetarian version by adding vegetable broth instead of chicken. 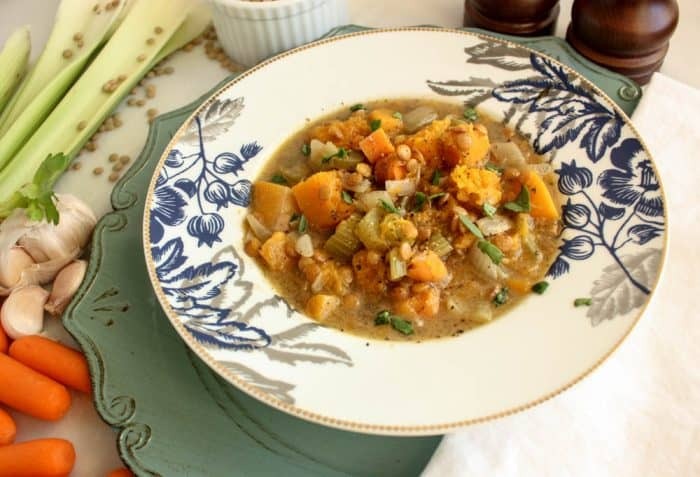 Ready for a healthy and easy slow cooker soup? 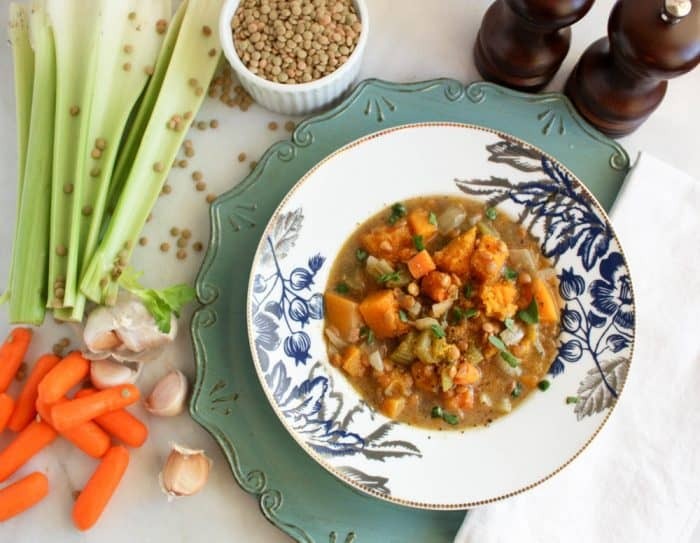 This easy Lentil & Butternut Squash Slow Cooker Soup is gluten and daily free. Next, peel, de-seed, and chop your butternut squash into about 1 inch, bite-sized pieces. Add them to the bottom of the crockpot. Chop up your onion, carrot, and celery, and dice your garlic. Add this with the butternut squash. Lastly, top the mixture with the lentils and spices. I like to make this the night before I'm going to serve and place it in the fridge overnight. In the morning, I take out the crop pot, add the chicken stock and coconut milk, set it to low and let the soup simmer all day long or at least 8 hours. When you come home, this will be creamy and combined for consuming. Want to make this later today…sounds so good! How many ozs. of coconut milk and do you have the nutritional data? Thanks for sharing!